The internationally bestselling author of Follow Your Heart uncovers hope in the midst of tragedy in these three utterly transfixing novellas set in Susanna Tamaro's native Italy. In "Answer Me," an orphaned girl with a troubled past desperately searches for a sign that she is loved while cultivating an inner strength that allows her to persevere. In "Hell Does Not Exist," an abused wife attempts to protect her son, who becomes the source of her greatest joy and her most profound devastation. And in "The Burning Forest," a widower recounts the unraveling of his marriage and seeks the forgiveness of his estranged daughter. Hauntingly powerful and exquisitely written, Answer Me is a spiritually galvanizing book by a writer of international stature. The internationally bestselling author of Follow Your Heart" uncovers hope in the midst of tragedy in these three utterly transfixing novellas set in Susanna Tamaro's native Italy. In "Answer Me," an orphaned girl with a troubled past desperately searches for a sign that she is loved while cultivating an inner strength that allows her to persevere. In "Hell Does Not Exist," an abused wife attempts to protect her son, who becomes the source of her greatest joy and her most profound devastation. And in "The Burning Forest," a widower recounts the unraveling of his marriage and seeks the forgiveness of his estranged daughter. 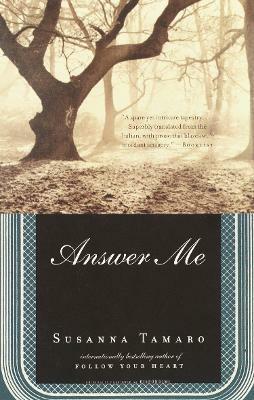 Hauntingly powerful and exquisitely written, Answer Me is a spiritually galvanizing book by a writer of international stature. Susanna Tamaro is the author of ten books of fiction and nonfiction, published in more than forty countries. They include the novel Follow Your Heart; a memoir, Turning Home; a collection of short stories; and four children's books. Born in Trieste, Tamaro lives on a farm in Umbria.